Throughout its history, Rocky Mountain National Park has offered a wealth of experiences for families and kids of all ages. The Next Generation Fund promises to continue this tradition and expand on these experiences through these well-tested programs. Since 1993, this program has encouraged children and their families to explore and experience the National Parks with age-appropriate activities and activity booklets. 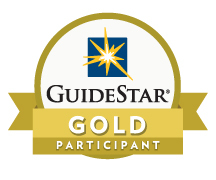 Purpose: This program helps children and their families to explore and experience Rocky Mountain National Park up close. Through engaging activities and books, Junior Rangers develop a love of nature and respect for all life, helping them develop a sense of commitment to the future of parks and protected areas. The Next Generation Fund supports the program through the development and publication of activity booklets and innovative activities for Junior Rangers. Annual Need: Development, editing, printing and distributing these free Junior Ranger activity booklets and badges requires $29,000 per year in support from the Next Generation Fund endowment. 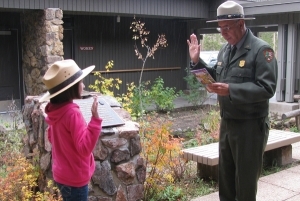 History: The Junior Ranger program at Rocky Mountain National Park was created in 1993. Today it exists alongside 296 similar programs found at most other national parks. Accomplishments: The program at Rocky Mountain National Park annually awards Junior Ranger badges to about 8,000 children and will be expanded each year to reach more than 20,000. Nationally, more than 440,000 children participate each year. 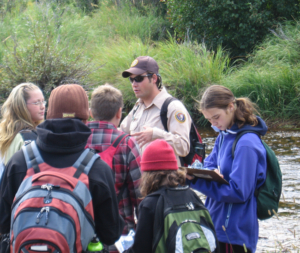 Students preparing for careers in environmental sciences apply knowledge and gain professional experience by assisting at visitor centers, providing programs for park visitors and teaching environmental education to kids. Purpose: Students needing an internship for college graduation or recent graduates seeking field experience may qualify to work in the park as interns or fellows. Each year, 10 students work full-time for 10 to 14 week periods. They assist with environmental education, conduct interpretive programs, work at visitor centers, and, in winter, may lead naturalist snowshoe walks. They work alongside the professional ranger-naturalists and learn the art and craft of conducting educational programs in the field. Annual Need: Interns and fellows are paid a stipend to cover basic costs, including meals, a uniform, and housing. Currently, Rocky Mountain Conservancy provides $50,000 annually for this program through generous donors. History: Student interns have long been a part of the park’s educational resources. Funding was decreasing, however, and something was needed to support the ever-growing needs for more environmental education staff. Accomplishments: Interns and fellows help the park’s environmental education program serve more than 8,000 school children through outreach and onsite educational visits. They assist in providing information at five park visitor centers and they conduct nature walks, snowshoe walks, and special programs. Grant-funded fellows also assist with the Rocky Mountain Conservancy’s Field Seminar programs, learning first-hand how a nonprofit conservation organization works. “Thanks for the support, help, fun, friendship, inspiration, confidence, gifts, laughs, leadership, example, knowledge, trust, memories, love, companionship, jokes, guidance, experiences, fellowship, care, joy, understanding, advice, hugs, stories, patience, and above all, a summer we’ll never forget.” – Kristin, Andrea, and Dave / Summer Interns. Heart of the Rockies is a successful, curriculum-based educational program that serves more than 8,000 students annually through class outings and offsite outreach visits. Purpose: Heart of the Rockies, a successful, curriculum-based educational program, serves students through class outings and offsite outreach visits to classrooms and other group gatherings. School and youth groups learn about the natural and cultural history of the region with emphasis on the ecology of the mountain region and the human relationship with nature over time. Annual Need: With $66,000 in yearly financial support from The Next Generation Fund endowment, this program has been expanded with additional staff to serve more students as well as increasing transportation assistance funds to enable participation by diverse school and community groups needing financial support. 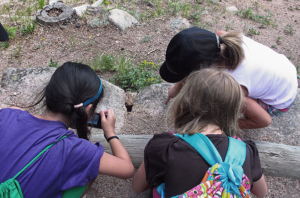 History: Created in 1994, Heart of the Rockies serves the environmental education needs of thousands of school-aged youth living along Colorado’s Front Range and in west-slope communities. Using the national park as a classroom, the program emphasizes the inter-relatedness of all life and its dependence on the quality of our environment. Accomplishments: More than 8,000 school children are educated through the Heart of the Rockies program each year. 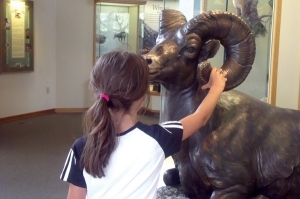 Since 1987, the Rocky Mountain Conservancy has invested more than one million dollars to design, install and maintain hands-on exhibits for children in Rocky Mountain National Park. Purpose: Educational exhibits provide basic natural history lessons in unique ways to an estimated half ma illion children and their families each year. Over the years, donors to the Rocky Mountain Nature Association have contributed to the development of many of these educational exhibits in Rocky Mountain National Park visitor centers. Changes in technology have created new and captivating ways to present natural and cultural history lessons, but it doesn’t take long for the current “state-of-the-art” to become outdated. No matter how interesting or durably exhibits are built; they still suffer from wear and tear. No kid should be disappointed by an “Out of Order” sign. Annual Need: Donor boxes appeal to park users to pitch in to help maintain exhibits. But replacement and updating must be done regularly to keep exhibits attractive and functioning. Currently, exhibit needs are being comprehensively reviewed by the National Park Service to identify opportunities and determine priorities. History: Beginning with the Kawuneeche Visitor Center project in 1987, the Rocky Mountain Nature Association has contributed funds from the sale of educational materials to create and maintain exhibits in park visitor centers. As a focal point for environmental education, the Moraine Park Visitor Center offers some of the best exhibits for kids found anywhere in the National Park System. The Fall River Visitor Center wildlife exhibits and Discovery Center were specifically intended to capture kids’ imaginations. As a result of philanthropy for the park, Rocky Mountain National Park boasts some of the best children’s exhibits in the National Park System. Accomplishments: The Rocky Mountain Nature Association has helped design, fabricate and install educational exhibits at Kawuneeche, Moraine Park and Fall River Visitor Centers. These exhibits represent an educational investment of one million dollars since 1987. The Rocky Mountain Conservancy continually provides funds to repair or replace exhibits as needed. Purpose: The Rocky Mountain Conservation Corps offers motivated and qualified college age students a summer’s work in our magnificent national park and forests. Some may not have had previous opportunities for experiences in nature. The long-term goal of this program is to cultivate the conservationists of tomorrow by challenging students to learn by doing, to value our natural resources by understanding what it takes to protect them, and encourage them to explore what it takes to be a leader in this field. The National Park Service and U.S. Forest Service give guidance and training to the crews, along with providing vehicles for transportation and the tools needed for exhausting manual conservation work. The Rocky Mountain Conservancy manages the program, including recruiting, educational training and providing the financial stipend that supports crew members during their summer. History: Created to introduce college-age scholarship students to the wonders of Rocky Mountain National Park, the Conservation Corps began with a $50,000 gift from the Daniels Foundation to fund two crews. Subsequent donations have enabled the Conservation Corps to work with more than 150 students in its first ten years. 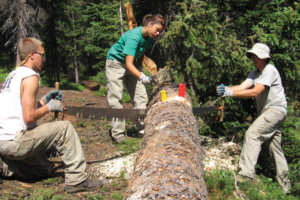 In 2008, the Corps expanded to assist the Arapaho-Roosevelt National Forests. A fourth crew expanded the program in 2009. The Next Generation Fund augments donor-designated support and foundation grants to enable continued program expansion. Accomplishments: Summer work for the Conservation Corps includes maintaining trails, repairing historic buildings and restoring natural landscapes. Students are provided on–the-job training as well as educational opportunities and exposure to careers in conservation and work opportunities within federal agencies. Examples of tasks accomplished by the Corps include: construction of new trail, re-routing trails, repair and maintenance of hiking trails, installation and/or repair of directional signs, bridges, trail water bars, drains and removal hazard trees. Work was completed in Rocky Mountain National Park, Arapaho-Roosevelt National Forest and the Rawah Wilderness. Annual Need: In 2014, six crews worked in the park and forests at a cost of $181,000. 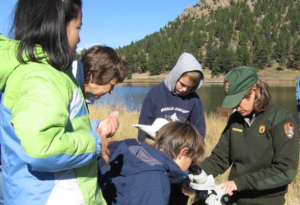 Purpose: Rocky Mountain Field Seminars provide in-depth learning experiences with Rocky Mountain National Park as a classroom, with renowned professionals from diverse environmental fields. Field classes are designed to increase awareness of the need for stewardship of natural and cultural resources through education for teachers, adults, families and children. Field programs also provide opportunities for children and adolescents who may be at risk, or disadvantaged, to develop an appreciation for environmental stewardship. With a focus on the future of our public lands, classes are structured to increase awareness of the environment and environmental stewardship. Annual Need: With $30,000 in yearly financial support from The Next Generation Fund Endowment, this program has been expanded by adding programs that appeal to children. A teacher training workshop has been created to enable concepts that are presented in seminars to be brought to the classroom. History: Renowned alpine ecologist Dr. Beatrice Willard started the Rocky Mountain Field Seminars program in 1962. Over the years the program has appealed to well-educated park aficionados, drawing up to one thousand participants annually. Instructors are respected in natural history fields and drawn from the ranks of college professors. Rocky Mountain Field Seminars is now broadening its emphasis from specialized adult learning to families and children. Accomplishments: Highly successful adult seminars have been complemented by the wide range of youth seminars offered since 2008. Intergenerational seminars bring together family members of different ages to explore the wonders of Rocky Mountain National Park. Regularly-scheduled seminars for kids are repeated during the season to allow park visitors to optimize participation. 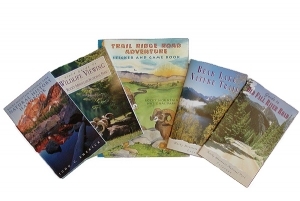 The “Publications for the Next Generation” program produces educational materials to encourage awareness, appreciation, and enjoyment of national parks and forests. Purpose: The “Publications for the Next Generation” program produces educational materials to encourage awareness, appreciation and enjoyment of national parks and forests. It assists the National Park and Forest Service in extending a conservation message to young people, encouraging an interest in the wonders of public lands. The publications program recognizes that educational materials such as books, videos and games can extend conservation messages beyond the limits of classrooms, ranger-led hikes and seminars and the portability of these items allows them to be shared and used frequently and repeatedly. The Next Generation Fund underwrites the cost of developing publications for children and those who will be tomorrow’s conservationists. History: The publications program was a cornerstone of the organization’s foundation in 1931, established to educate visitors about the natural and cultural history of the park. Beginning with small pamphlets and brochures about plants and wildlife, the program gradually broadened to include a variety of topics. In 1997, ROCKY MOUNTAIN CONSERVANCY supporter Janet Hagen provided a donation making possible a sticker and game book for children, Trail Ridge Road Adventure. In recent years gifts from supportive donors have enabled the creation of an expanding array of books, games and other educational materials. And a variety of trail and road guides. Most of these resulted from direct donations. Annual Need: With $22,000 in yearly financial support from The Next Generation Fund Endowment, this program concentrates on children’s publications and the production of items for sale in visitor center- nature stores that actively engage children’s interest in their national parks. Why give to a federally-funded park? Why an endowment? Get answers at our Frequently Asked Questions page.